Double-walled and thermally insulated Durotherm keeps food hot for up to 2 hours on the table or buffet. Start cooking on the stovetop, then just clip on the protective heat-retaining serving base made from stainless steel and bring to table. It finishes your cooking until you are ready to eat. Using a small amount of water it cooks gently and any steam that does rise collects in the groove between the pot and its unique convex lid, forming a seal that keeps heat in and oxygen out. Returned moisture bastes the food as it cooks. Vegetables cooked in this was retain their natural nutrients - they look fresh and colourful, and taste wonderful. Meats and fish too, are succulent, juicy, and bursting with flavour. 60 percent more energy efficient than standard cookware. 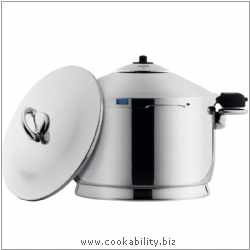 More information on Durotherm Cookware here. We are an Authorised Kuhn Rikon Duromatic Centre, buy with confidence. Stainless steel trivet and the regular insulated base and lid for presentation are included.